CARFAX One-Owner. Certified. Clean CARFAX. 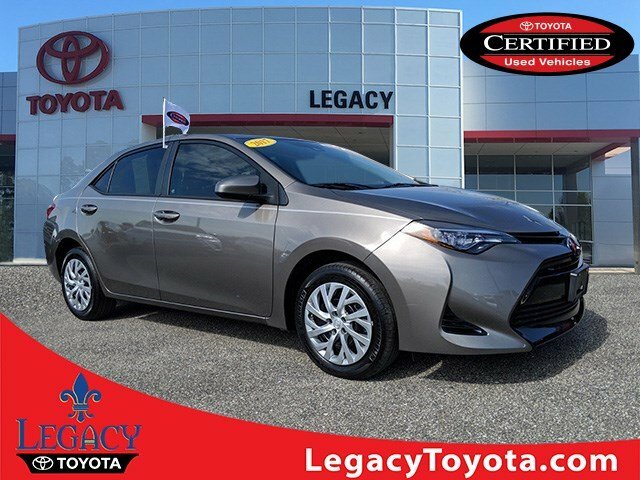 TOYOTA CERTIFIED, BALANCE OF FACTORY WARRANTY, ONE OWNER, 160 POINT Quality Assurance INSPECTION, 7YR/250K LIMITED WARRANTY, **BLUETOOTH HANDS FREE**, **BACK UP CAMERA**, Corolla LE, 4D Sedan, 1.8L I4 DOHC Dual VVT-i, Falcon Gray Metallic, Black w/Fabric Seat Trim, Air Conditioning, Automatic temperature control, Distance-Pacing Cruise Control, Exterior Parking Camera Rear, Fully automatic headlights, Heated door mirrors, LED Daytime Running Lights (DRL), Power door mirrors, Power windows, Rear window defroster, Steering wheel mounted audio controls.28/36 City/Highway MPG Falcon Gray Metallic 2017 Toyota Corolla LE 4D SedanToyota Certified Used Vehicles Details:* Powertrain Limited Warranty: 84 Month/100,000 Mile (whichever comes first) from original in-service date* Limited Comprehensive Warranty: 12 Month/12,000 Mile (whichever comes first) from certified purchase date. 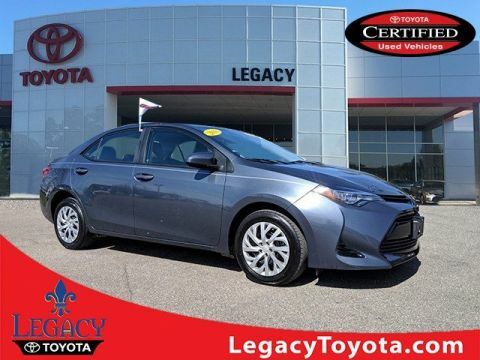 Roadside Assistance for 1 Year* 160 Point Inspection* Transferable Warranty* Roadside Assistance* Warranty Deductible: $50* Vehicle HistoryAwards:* 2017 KBB.com 10 Best Sedans Under $25,000 * 2017 KBB.com 5-Year Cost to Own Awards * 2017 KBB.com 10 Most Awarded Brands * 2017 KBB.com Best Resale Value AwardsWhen you buy from Legacy Toyota you're not just purchasing a vehicle, you're joining our family. Our staff are committed to giving you the very best experience, and we stand behind the quality of our vehicles. 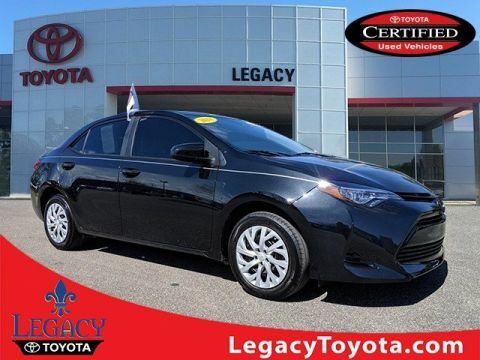 Every vehicle purchased here automatically makes you a member of the Legacy Toyota MVP Club. With this exclusive membership, you'll have priority scheduling for service appointments, earn points with our service rewards program, and have access to the member's only lounge. 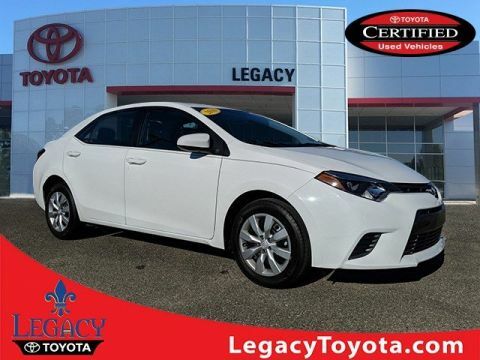 Legacy Toyota is a family-owned business, and we pledge to serve our customers with honesty and integrity. We strive for total customer satisfaction and want to exceed your expectations. If you're looking for an opportunity to grow your career, we are always looking for energetic applicants and suggest you consider joining our growing team..Highly Rated by our Customers with 4.7 Star Reviews on Dealer Rater and Tallahassee's #1 Volume Used Car Dealership.